It’s beginning to look a lot like electoral season. Everywhere you go, political parties are vying for your vote, even going as far as to text Albertans directly. With all too early political messaging and unsolicited texts abound, it makes you wonder why political parties even continue a practice like this. 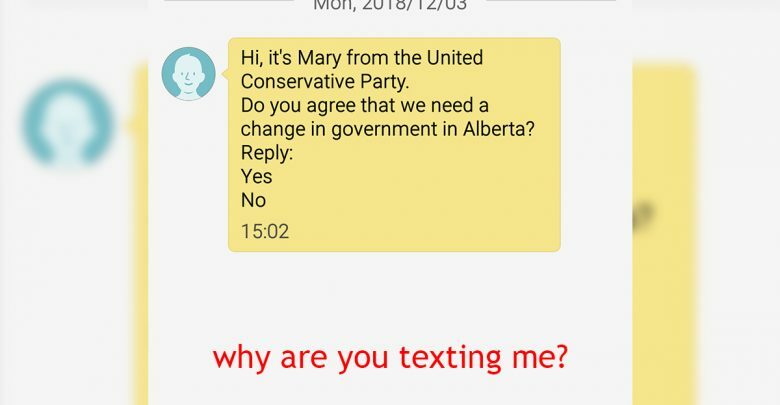 As many of us know, Mary, the texting robot of the United Conservative Party, wants to know if she can count on you in the coming election. No matter that the election has just been called, the Conservatives have your phone number and now they — or rather Mary — wants your vote. The NDP has their own texter on front lines named Mike, who has been equally as annoying as Mary. The only difference is that Mike seems to be a human, which somehow is even more irritating. At least Mary is just following orders; I expected better from you, Mike. But hold on, isn’t there some law that prevents Mary and Mike from sending me unsolicited text messages? Well, there is: it’s called Canada’s Anti-Spam Legislation (CASL). But according to the government of Canada, “commercial electronic messages (CEMs) sent by or on behalf of a political party… are excluded from… CASL, if the primary purpose of the CEM is to solicit a contribution.” The reason for this is that it’s apparently in the public interest to receive these texts. Interest of the party maybe, and even that’s debatable. It’s appalling that political parties would even consider these tactics. Given that they’re politicians, we can only assume they’re human, and if that’s the case, they should know that when people receive calls or texts from any kind of telemarketer, they will eventually be compelled to automatically reject the telemarketer’s message. It seems these parties were so preoccupied with whether or not they could send these messages that they didn’t stop to think if they should. But this is a democracy. Surely if voters really didn’t want to hear from politicians through texts and cold-calls, they’d put their vote elsewhere. The problem is that as we get deeper into the electoral season, these unsolicited messages will likely become a staple of every big party out there. Where can a voter go when all around are parties lowering themselves to the most annoying tactics in order to gain the upper hand? Seemingly the only way to escape this immense political spam is to move to the territories, where the cell reception is made up and Albertan political parties can’t reach you. Someone needs to let these politicians know they’re only hurting their reputation in continuing with the spam. People have a bad enough view of the government anyways. Things like the SNC-Lavalin scandal, and a little less recently, the Alison Redford expenditure scandal, only work to widen the gap between representative and constituent. Having Mary slide into my DMs is not gonna help your case.